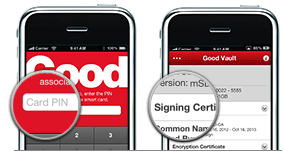 DeviceFidelity announced that its Good Vault system will provide identity and access management to iPhones. By adding a sleeve to iPhone 4 and 4S models, the Good Vault system enables the Apple devices to read microSD cards. Once installed, the case effectively becomes one component of the two-factor identification process, with the second factor being the entry of a PIN. Once authenticated, users gain access to Good for Enterprise email. The system also accounts for stolen devices and microSD cards as access to Good for Enterprise email always requires the PIN for access. Additionally, Good’s management software enables for remote wipe of data from smart phones. The Good Vault solution utilizes a Secure Element on a microSD or smart card, allowing for strong authentication without compromising the mobile form factor or user experience. Access to Good for Enterprise is secured through card-based authentication and email messages sent to iOS devices are encrypted and signed to ensure privacy and integrity. Ensure integrity and security of corporate email and data.